Indulge skin with the Wood and Spice After Shave Balm from iconic, Italian-born grooming brand, Proraso. Expertly developed with quality and performance in mind, the lightweight formula combines a powerful blend of essential oils and extracts to leave skin feeling calm, soft and hydrated. 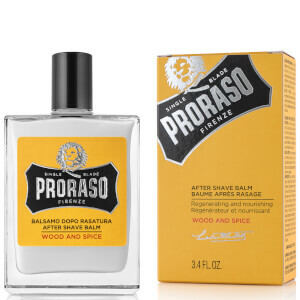 Rich, sensual notes of Cumin and Saffron add depth to the woody, earthy scent. Dermatologically tested. Free from parabens, silicones, mineral oils, SLS and artificial colours.